It's been 17 years since Amy Stoller Stearns first came to work at Detroit Lakes' Historic Holmes Theatre, and nearly 16 years since she became its executive director. In that time, the Battle Lake native has made the theater into a hub for arts activity in the lakes area, and beyond. She has also been a regular attendee at Arts Advocacy Day at the Capitol, held each spring in St. Paul — so when this year's Arts Advocacy Day was held on Tuesday, March 12, the Minnesota Citizens for the Arts (MCA) decided to take the opportunity to recognize Stearns for all the work she has done to improve arts access for northwest Minnesota residents. 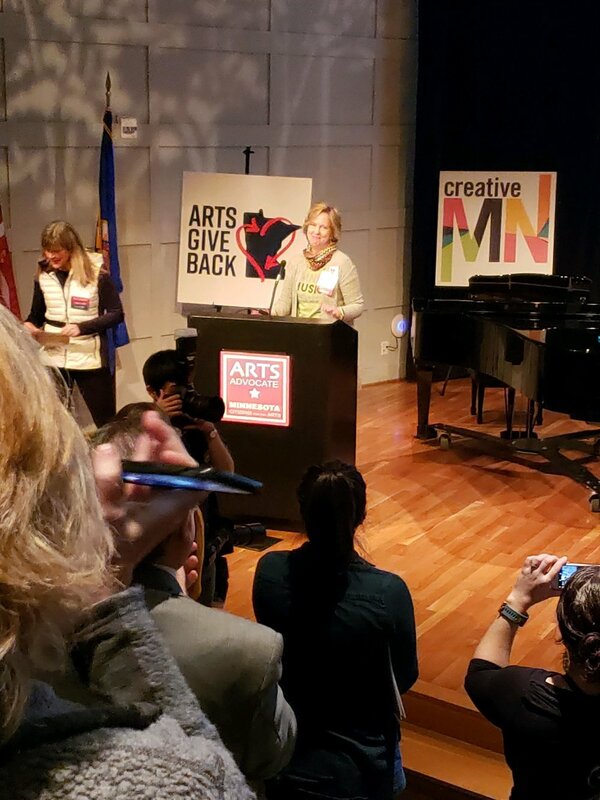 Stearns was presented with MCA's 2019 "Larry Award" during the kickoff event for Arts Advocacy Day, which was held at the Minnesota History Center on Tuesday morning. Though Stearns knew in advance that she would be this year's recipient, having been nominated for the award by Lake Region Arts Council Executive Director Maxine Adams, she admitted that she nevertheless "got a little teary eyed" when MCA Executive Director Sheila Smith presented the award to her. "I was touched — and very humbled," said Stearns, adding that she counts at least a couple past "Larry Award" recipients as her personal mentors in the arts community. According to information available on the MCA's website, www.artsmn.org, the "Larry Award" is given each year to "unsung heroes in the arts community who work as arts advocates behind the scenes to improve arts access to everyone across Minnesota." The award is named in honor of Lawrence Redmond, who has been MCA's lobbyist and unsung hero since the 1970s; the award has been given out at Arts Advocacy Day every year since 2007.